What are Plumbing Vents and Traps? Interior plumbing continues for a second day with the addition of some of the more recognizable fixtures for the laundry room and hot-water tank in the garage. The Plumbing is also vented through the roof as appropriate to prevent the back-up of gasses and prevent a vacuum from forming inside the pipes, causing water flow problems. Pipe traps are also put in place as a water-lock to prevent gasses and sewage smells from coming back up the drains, as well as a point to collect items that may have accidentally gone down the drain. In the process of installing the plumbing system in your new home, you have to see to it that you use the right vents for your needs and purposes. Failing to ensure that you use the right types of vents and traps will do you no good, and will only present you with problems in the end. Here are some of the considerations that you have to look into in the process of putting together a drainage system for your home. Go through the following considerations and keep them in mind as you choose the components that you will use in your own house. Plumbing vents and traps refer to the different parts of your plumbing system that play an integral role in making the over-all system function. It is imperative that you do not only find these components in the best possible quality, but also that the different parts that you will use for your own home complement one another perfectly. There are many resources available to ensure that you will be using the best options in the market. You may also ask the help of a professional in going through your options as well, to ensure that you will be making the best possible choice. Plumbing vents are pipes that run from the drains to the outside of a structure, be it a house or any other building. Plumbing vents have several important purposes. One of the main reasons you would need plumbing vents, is to divert sewer gasses to the outside of your home. Sewer gases can build up to form dangerous bacteria if not properly ventilated. 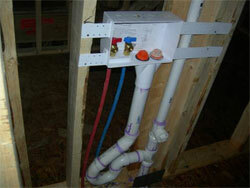 Plumbing vents also help to equalize pressure in your plumbing pipes. Plumbing vents bring air into the pipes that will push the water through the pipes allowing gasses to escape. A trap is a P-shaped pipe, commonly called a P-trap that is located within a plumbing fixture, normally below it. A ninety-degree fitting on the outlet side of a U-bend creates a P-like shape. The trap is installed under most home fixtures. Sinks, toilets, and bathtubs all have either external or internal traps. The traps shape allows it to retain water after the fixture's use. The excess water creates a seal, which prevents sewer gas from passing through the drainpipes and back into your home. Traps can be taken apart as a cleanout feature if a large object goes down the drain or hair build up occurs causing a clog. The way in which these vents and traps will work together will all be illustrated in the plumbing diagram that your contractors will use as guide for the construction project. Obviously, the placement of these individual components highly depends on the layout of the different rooms in your house as well. Make sure that you go through the blueprint at least once before you hand it over to your contractors. Check whether the individual elements are placed where they will be able to serve their main purpose in the over-all system. Plumbing vents and traps come in different styles and sizes, so you have to see to it that you choose the ones that will fit your needs the best. However, unless you are a plumbing contractor it is impossible to know the main differences between them. With this said, try to access all the resources that you can find about the various options that you will come across in the process of laying the plumbing system in your home. Since you and your family will be the ones who will use the system, then you should at least have a say in the components that will be installed in your home. These vents and traps will only be able to serve their main functions if they are connected seamlessly. With this said, you have to ensure that you hire contractors that will be able to incorporate these individual parts to the over-all system as effectively as possible. See to it that the right installation tools and materials are used as well. This way, you will not have to undertake a repair and maintenance job in the near future, yet still be able to use your home plumbing as well as possible. It will do you well to stock up on the most basic materials that you will use to tend to possible damages on the different parts of your plumbing system. Since there is no other way to stop leaks without turning off your over-all system, it is highly advised that you prepare yourself with the different things that you may use to remedy minor problems at once. This way, you will be able to do away with any problem, especially when it comes to using the plumbing system in your house. Implementing the necessary contingency measures at once will also help you avoid having to deal with worse problems in the future.